Samaria (/sə.ˈmɛər.i.ə/; Hebrew: שֹׁמְרוֹן‎‎, Standard Šomron, Tiberian Šōmərôn; Arabic: السامرة‎‎, as-Sāmirah – also known as جبال نابلس, Jibāl Nāblus) is a name for the mountainous, central region of the ancient Eastern Mediterranean, based on the borders of the biblical Northern Kingdom of Israel and especially the Israelite tribes of Ephraim and Manasseh. The name "Samaria" is derived from the ancient city of Samaria, the capital of the Kingdom of Israel (Samaria). Since 1967, Samaria has been used by Israeli officials to refer to the north of the West Bank, as the administrative Judea and Samaria Area. Jordan ceded its claim to the area to the Palestine Liberation Organization (PLO) in August 1988. In 1994, control of Areas 'A' (full civil and security control by the Palestinian Authority) and 'B' (Palestinian civil control and joint Israeli-Palestinian security control) were transferred by Israel to the Palestinian Authority. The Palestinian Authority and the international community do not recognize the term "Samaria"; in modern times, the territory is generally and almost universally known as part of the West Bank. According to the Hebrew Bible, the Hebrew name "Shomron" is derived from the individual [or clan] Shemer, from whom King Omri purchased the site for his new capital city (1 Kings 16:24). 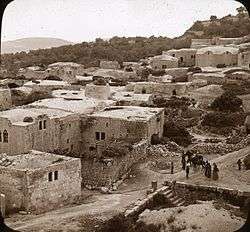 In modern times, Samaria was one of six administrative districts of the Mandatory Palestine. Following the occupation of the West Bank by Israel in 1967, the Israeli right began to refer to the territories by their biblical names and argued for their usage on historical, religious, nationalist and security grounds. The fact that the mountain was called Shomeron when Omri bought it may indicate that an earlier etymology of the name may be "watch mountain". In the earlier cuneiform inscriptions, Samaria is designated under the name of "Bet Ḥumri" ("the house of Omri"); but in those of Tiglath-Pileser III and later it is called Samirin, after its Aramaic name. To the north, Samaria is bounded by the Jezreel Valley; to the east by the Jordan Rift Valley; to the west by the Carmel Ridge (in the north) and the Sharon plain (in the west); to the south by the Jerusalem mountains. 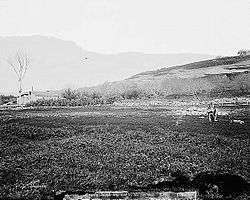 In Biblical times, Samaria "reached from the [Mediterranean] sea to the Jordan Valley", including the Carmel Ridge and Plain of Sharon. The Samarian hills are not very high, seldom reaching the height of over 800 metres. Samaria's climate is more hospitable than the climate further south. The mountain ranges in the south of the region continue into Judaea without a clear division. In 6 AD the region became part of the Roman province of Judaea, after the death of king Herod the Great. As a result of the 1948 Arab–Israeli War, most of the territory was unilaterally incorporated as Jordanian-controlled territory and was administered as part of the West Bank (west of the Jordan river). The Jordanian-held West Bank came under the control of Israel during the 1967 Six-Day War. Jordan ceded its claims in the West Bank (except for certain prerogatives in Jerusalem) to the PLO in November 1988, later confirmed by the Israel–Jordan Treaty of Peace of 1994. In the 1994 Oslo accords, the Palestinian Authority was established and given responsibility for the administration over some of the territory of West Bank (Areas 'A' and 'B'). Israeli settlements in the West Bank are considered by the international community to be illegal under international law, but the Israeli government disputes this. The ancient site of Samaria-Sebaste covers the hillside overlooking the Palestinian village of Sebastia on the eastern slope of the hill. Remains have been found from the Canaanite, Hellenistic, Herodian, Roman and Byzantine era. Archaeological finds from Roman-era Sebaste, a site that was rebuilt and renamed by Herod the Great in 30 BCE, include a colonnaded street, a temple-lined acropolis and a lower city, where John the Baptist is believed to have been buried. The Harvard excavation of Samaria, which began in 1908, was headed by Egyptologist George Andrew Reisner. The findings included Hebrew, Aramaic, cuneiform and Greek inscriptions, as well as pottery remains, coins, sculpture, figurines, scarabs and seals, faience, amulets, beads and glass. The joint British-American-Hebrew University excavation continued under J.W. Crowfoot in 1931–35, during which some of the chronology issues were resolved. The round towers lining the acropolis were found to be Hellenistic, the street of columns was dated to the 3–4th century, and 70 inscribed potsherds were dated to the early 8th century. In 1908–35, remains of luxury furniture made of wood and ivory were discovered in Samaria, representing the Levant's most important collection of ivory carvings from the early first millennium BCE. Despite theories of their Phoenician origin, some of the letters serving as fitter's marks are in Hebrew. The Samaritans (Hebrew: Shomronim) are an ethnoreligious group named after and descended from ancient Semitic inhabitants of Samaria, since the Assyrian exile of the Israelites. Religiously, the Samaritans are adherents of Samaritanism, an Abrahamic religion closely related to Judaism. Based on the Samaritan Torah, Samaritans claim their worship is the true religion of the ancient Israelites prior to the Babylonian exile, preserved by those who remained in the Land of Israel. 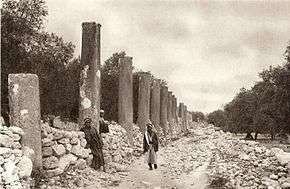 Their temple was built at Mount Gerizim in the middle of 5th century BC and was destroyed under the Macabbean (Judean) king John Hyrcanus late in 110 BC, although their descendants still worship among its ruins. The antagonism between Samaritans and Jews is important in understanding the Bible's New Testament stories of the "Samaritan woman at the well" and "Parable of the Good Samaritan". ↑ Emma Playfair (1992). International Law and the Administration of Occupied Territories: Two Decades of Israeli Occupation of the West Bank and Gaza Strip. Oxford University Press. p. 41. 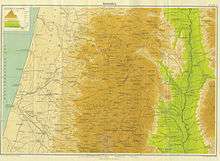 On 17 December 1967, the Israeli military government issued an order stating that "the term 'Judea and Samaria region' shall be identical in meaning for all purposes . .to the term 'the West Bank Region'". This change in terminology, which has been followed in Israeli official statements since that time, reflected a historic attachment to these areas and rejection of a name that was seen as implying Jordanian sovereignty over them. ↑ Singer, Isidore; et al., eds. (1901–1906). "Samaria". Jewish Encyclopedia. New York: Funk & Wagnalls Company. ↑ "The Center for Regional Councils in Israel". Website. ↑ "Holy Land Blues". Al-Ahram Weekly. 5–11 January 2006. Retrieved 2007-09-14.